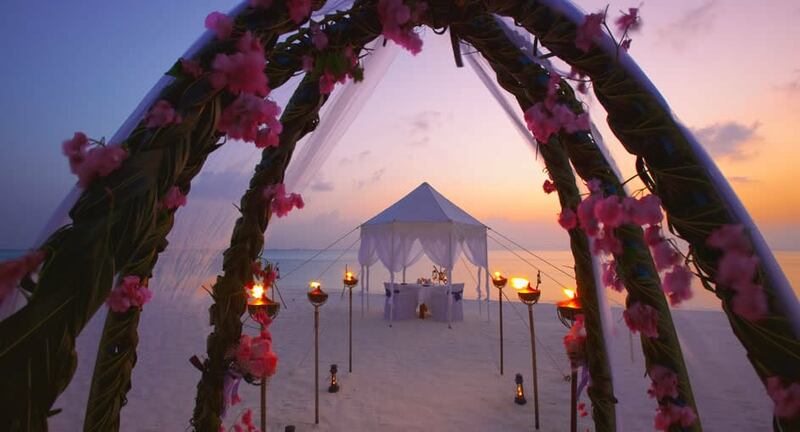 Maldives weddings for a lifetime of romance. Say ‘I do’ against a backdrop of cerulean blues and the swell of the Indian Ocean. On a private island with friends and family, or just the two of you under a white-canopied faree tent, Anantara Dhigu offers unrivalled settings for your dream event. Relax and beautify at the over water spa before a professional photoshoot on soft white sands. Honeymoon in style on a luxury yacht, spinner dolphins playing in your wake. Envision your wedding in the Maldives with our bespoke packages. Two minutes by pontoon from the resort, a private island awaits. Say your vows on a deck extending out over the water at sunset. Enjoy an oceanfront barbecue followed by Champagne toasts and dancing. With full catering capabilities, a bar and restrooms, ideal for up to 100 guests. Walk barefoot down a petal-strewn aisle to the rhythmic beat of the bodu beru drum. Exchange vows with the omniscient ocean as your witness. Celebrate with a marquée banquet or dine al fresco under the stars. Ideal for up to 150 guests.